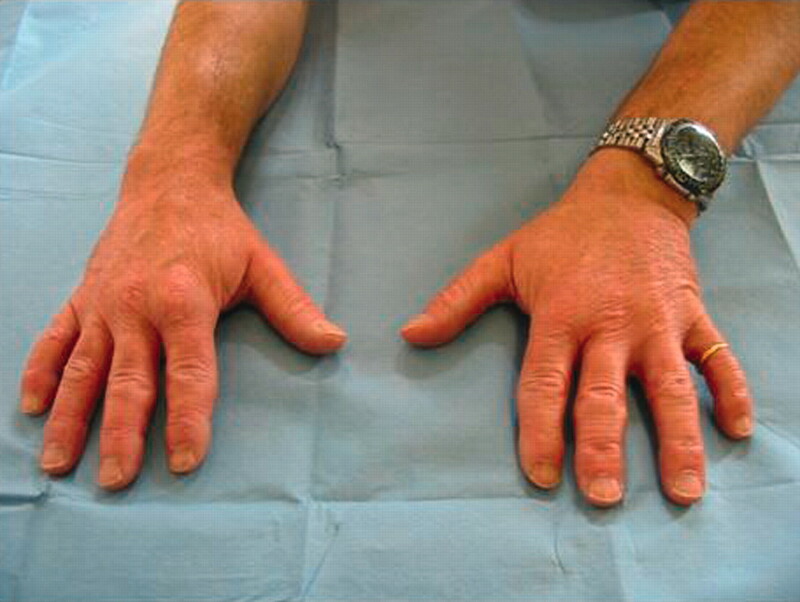 A 19 year old man attended hospital after his recent discharge from the navy owing to his hand arthropathy. His symptoms began aged 14 years with swelling but no pain or disability of his distal interphalangeal (DIP) and proximal interphalangeal (PIP) finger joints. At the age of 17 he joined the navy and 1 year later began to experience considerable pain in his hands while carrying out his duties. He was reassigned and after 3 months of light duties was symptom free, although his joints remained swollen and deformed (fig 1). Flexion at the PIP and DIP joints was limited (fig 2), and the hands were functionally normal with an average grip and pinch strength. He continued to work as a gardener with no joint symptoms. Both his father and paternal grandfather had had the same condition. 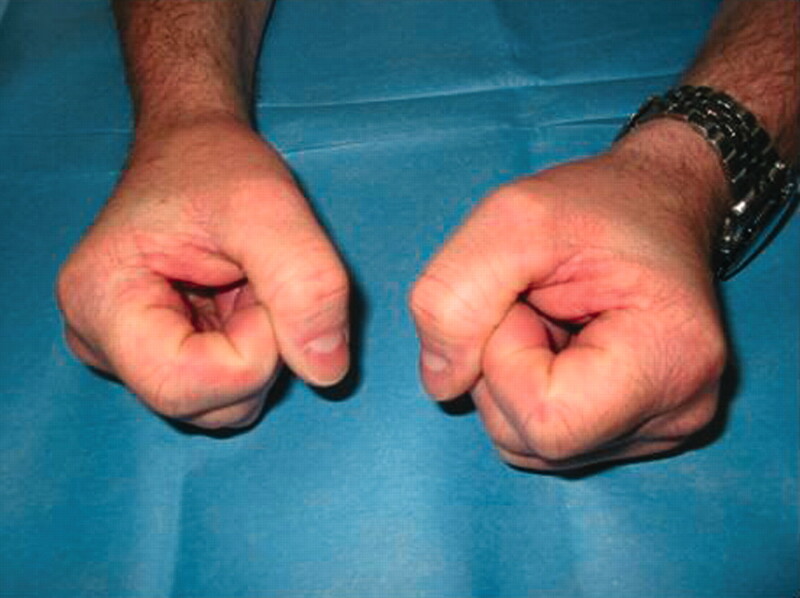 The PIP and DIP joints of the fingers of both hands are swollen. Flexion at the PIP and DIP joints is limited. Blood tests showed normal haemoglobin, white cell count, and erythrocyte sedimentation rate (ESR). 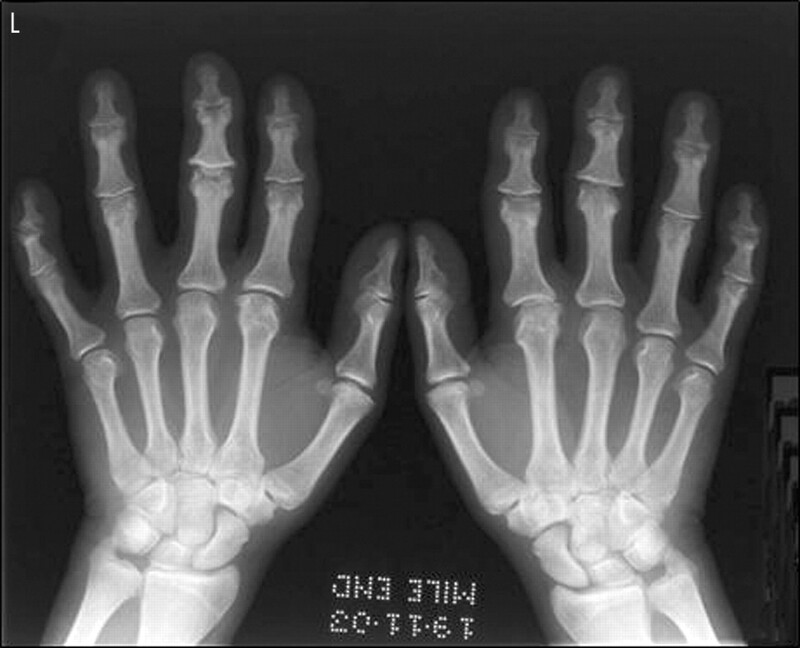 A hand x ray examination showed the classical radiological features of Thiemann’s disease with flattening, broadening, fragmentation, and irregular opacification of the phalangeal epiphyses (fig 3). Flattening, broadening, fragmentation, and irregular opacification of the phalangeal epiphyses. Treatment comprises reduction in those activities producing symptoms,7 with good response as illustrated by the sailor. Thiemann H. Juvenile epiphysenstorungen [Juvenile epiphyseal disturbance]. Fortschr Geb Roentgenstr Nuklearmed1909;14:79–87. Melo-Gomes JA, Melo-Gomes E, Viana-Queiros MJ. Thiemann’s disease. Rheumatology (Oxford)1981;8:462–7. Seckin U, Ozoran K, Polat N, Ucan H, Tutkak H. Thiemann’s disease: a case report. Rheumatol Int1999;18:157–8. Allison AC, Blumberg BS. Familial osteoarthropathy. J Bone Joint Surg Br1970;52:532–4. Dessecker C. Zur Epiphyseoneckrose der Mittelphalangen beider Hande. Dtsch S Chirurg1930;229:327–36. Schantz K, Rasmussen F. Thiemann’s finger or toe disease. Follow-up of seven cases. Acta Orthop Scand1986;57:91–3. Gewanter H, Baum J. Thiemann’s disease. J Rheumatol1985;12:150–3.